The Lakeview Getaway is the newest addition to the Brenwood Rentals’ log cabin getaways. For a relaxing treat in the picturesque Shenandoah Valley and Blue Ridge Mountains, come stay at Brenwood Rentals. 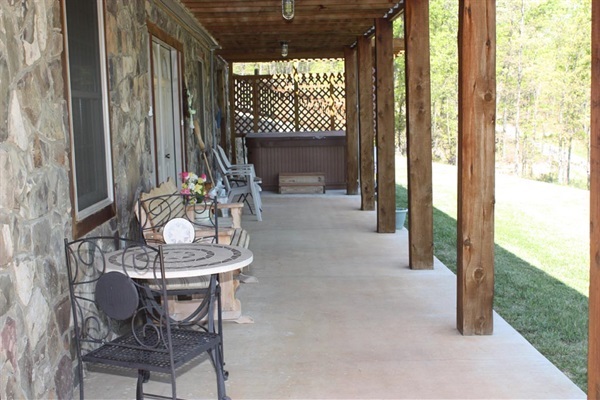 The lower level suite (which is being offered for rent) has a private entrance for your convenience of enjoying the pond, the breathtaking mountain ranges and the wooded area surrounding our property or unwinding and enjoying the hot tub. Imagine sitting by the campfire roasting marshmallows and making s’mores looking out over the lake (firewood is provided.) If you would be lucky to be here on a full moon night, the sight of the moon reflecting in the lake is a sight to behold! Enjoy your morning coffee on the covered porch in the wooden glider or at the log kitchen table looking at the lake. This suite sleeps 2-4 guests in our wonderful escape and has a fully equipped kitchen. Towels and linens are provided with no extra charge. Private bedroom with log queen bed and one bathroom. A futon in the living room. Cozy living room and kitchen/dining areas. This suite is perfect for a romantic weekend getaway, honeymoon or small family vacation.